Beloved children's books can feel timeless. When their authors live long lives, there's some kind of poetic justice. Think Maurice Sendak, author of "Where the Wild Things Are," who recently died at age 84. Or think of Laura Ingalls Wilder, who died at age 90. But some authors outlast nearly all of their counterparts. This is even as their stories continue to charm kids who are a mere fraction of their age. Beverly Cleary turned 100 on April 12. She is one in that small but esteemed group. The Oregon-based author is best known for kids' classics like "Henry Huggins", "The Mouse and the Motorcycle" and "Ramona Quimby, Age 8." Over the years, she's sold more than 91 million copies of her 39 books. They have sold all over the world. Her career has been lauded with everything from multiple Newbery Medals and Honors to a "Living Legend" designation. The latter came from the Library of Congress. If you've ever adventured along with the Quimby girls on Klickitat Street, you may know that Cleary is almost synonymous with Portland, Oregon. She spent much of her young life in the city. Then she turned her real-life experiences into children's books that incorporate real places that can still be visited today. And perhaps the perfect cherry on top of a Cleary-themed jaunt through the rose-studded city is a trip to the sculpture garden built in her honor in Grant Park in northeast Portland. 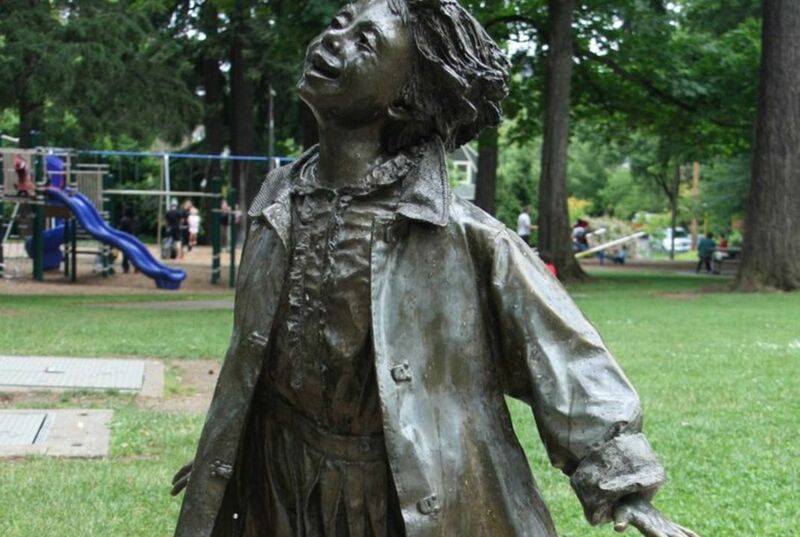 The Beverly Cleary Sculpture Garden for Children was built within the park in 1991 by a group of librarians, teachers and Portland locals eager to pay tribute to their favorite author of children's books. The park itself is featured in several Cleary books. It is most memorable as the site where Henry Huggins frantically digs up nightcrawlers. It features life-sized statues of Ramona Quimby, Henry Huggins and Huggins' dog, Ribsy. Quotes from the books and fountains make the garden even more fun. Cleary-curious travelers can also find a neighborhood map at the park that tells them how to investigate other local sites related to the author. Want to take your Cleary sculptural viewing to another level in honor of her 100th? Stop by the Multnomah County Library's central branch and see if you can find a plaque featuring a depiction of the timeless (and, seemingly, ageless) author. Why do beloved children's books feel timeless? They feel timeless because, often you read them more than once, and you can relate to them as you get older. For example, if a girl reads these books when she was younger and she can relate to them, she would most likely read them to her kids when she gets older and then the books would keep going through the family. The article says, "This is even as their stories continue to charm kids who are a mere fraction of their age." This shows that kids of all ages read these books and read them for the rest of their lives. I was interested in this article because I used to read her books and I liked them. I was surprised by this article because I didn't know that Beverly Cleary was that old. Beloved children's books feel timeless because they are usually easy reads and contain a very interesting and lovable plot. You can get sucked into reading a children's book and forget about everything else. In the first paragraph it says "Beloved children's books can feel timeless. When their authors live long lives, there's some kind of poetic justice. " If the author of the children's book lives a long time, it keeps the story feeling more alive and recent. Once the author passes away, it may be brushed over by newer books and authors. I chose this article because when I was in 2nd and 3rd grade, I was obsessed with the "Ramona Quimby" series by Beverly Cleary. I thought they were amazing and I bet if I went back and read one of them now, it would feel timeless because it's so easy to read. Beloved children's books feel timeless because they are loved by every generation. In the first paragraph it says "[the authors] stories continue to charm kids who are a mere fraction of their age." If a story is loved people will still read it no matter the age. For example, Beverly Cleary has sold "91 million copies of her 39 books. They have sold all over the world." In conclusion children's classics seem so timeless because each generation like them. In my opinion, Beverly Cleary is a great author and I love children's books. Because they stay in your mind forever. The children books feel timeless sense beverly dies and she was a well known author and she will be missed. Sense beverly died there will not be anymore books as fun as her were so books feel timeless and if it feel timeless then there is no fun. The children think that Beverly was good at writing then children will not enjoy any other books like hers and then the books will feel timeless and there will be no fun and so there you have it. Beloved children's books feels timeless because they have a certain story that makes you want to read more. For example Ramona Quimby is a fun little girl and her family is awesome. " When their authors live long lives, there's some kind of poetic justice. Think Maurice Sendak, author of "Where the Wild Things Are," who recently died at age 84. Or think of Laura Ingalls Wilder, who died at age 90." This shows how children's books can feel timeless. Beloved children's books feel like timeless for many reasons. First off the author probably don't want the characters to get older and then the book would have to end. Another reason is that not just kids read these books and they usually all contain hidden life messages. Beloved children's books feel timeless because the books will continue to be read by children in any generation. Not only will children read them but older people too. For example parents will read children books to their kids and will be passed on. The adult will reminisce the books and remember their childhood memories. In the article it says "Beloved children's books can feel timeless. When their authors live long lives, there's some kind of poetic justice",meaning experiencing a part you loved or enjoyed. beloved children's books feel timeless because when poets live a long life they feel timeless. The reason for that is because they have been rights for so long. In paragraph it says that "when a poet lives a long life the books seem to become timeless." That's because some people live till they are 80 or sometimes 90. Beloved children's books feel timeless because kids will just keep reading those books. Not all children can read, so adults have to read them the books. Some adults like to read children's books. These books could be past by children to children. In the story it says "Beloved children's books can feel timeless. When their authors live long lives, there's some kind of poetic justice."